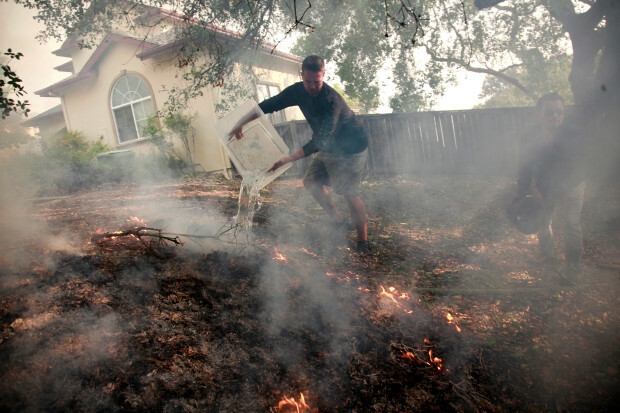 Home NationalNews OMG California is Burning from San Diego to Wine Country! OMG California is Burning from San Diego to Wine Country! 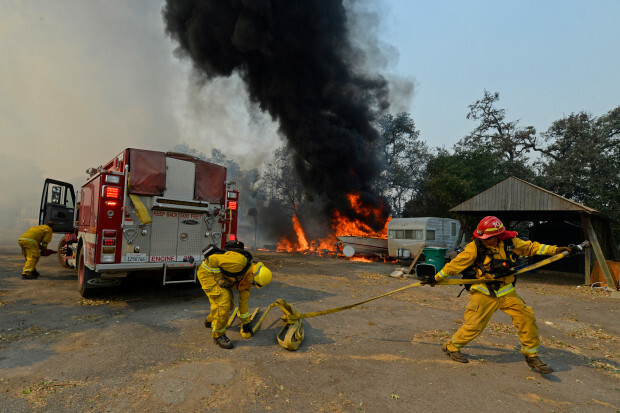 The featured image is from the CalFire.ca.gov website plotting the active fires in the state. 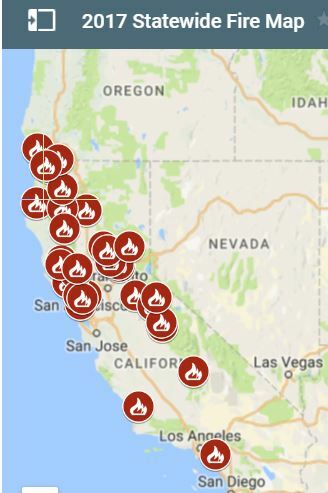 This map provides general locations of major fires burning in California. The fire locations are approximates. Some of the fires on the map are not in the jurisdiction of CAL FIRE and are under the command of another local or federal fire agency. 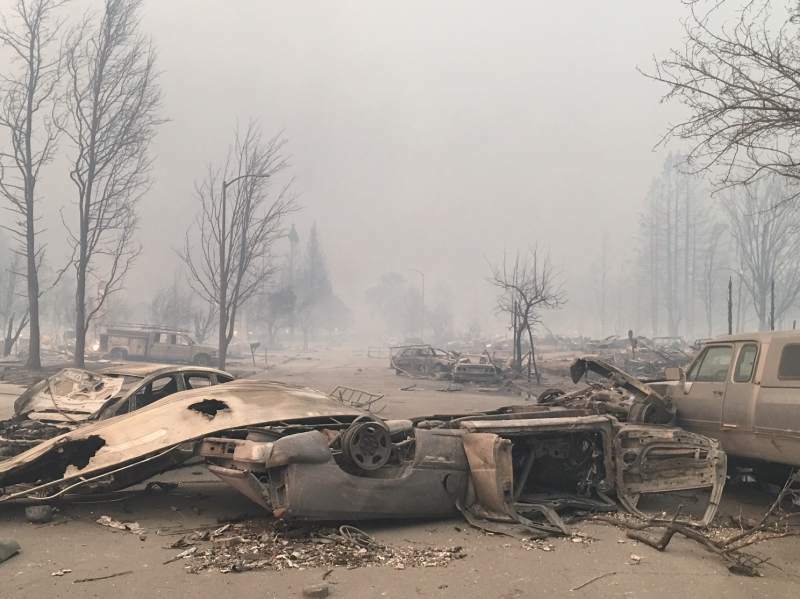 Many of my Nor-Cal friends have told me they have NEVER seen anything like THIS in some of the hottest spots. 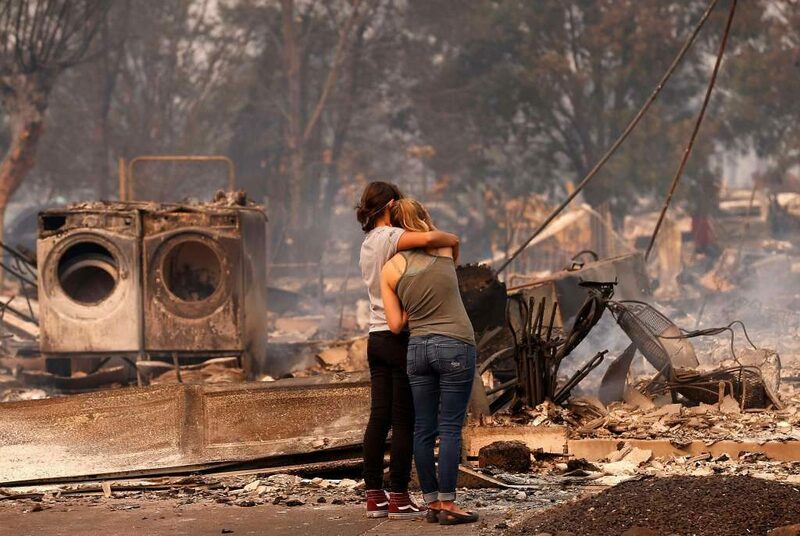 Santa Rosa area has reported 1,500 homes and business BURNED completely. Just ONE of those dots on the CalFire map in the Sonoma and Napa counties area went form 200 Acres to 20,000 overnight driven by the winds blowing steady at over 30 MPH gusting to 65 MPH! 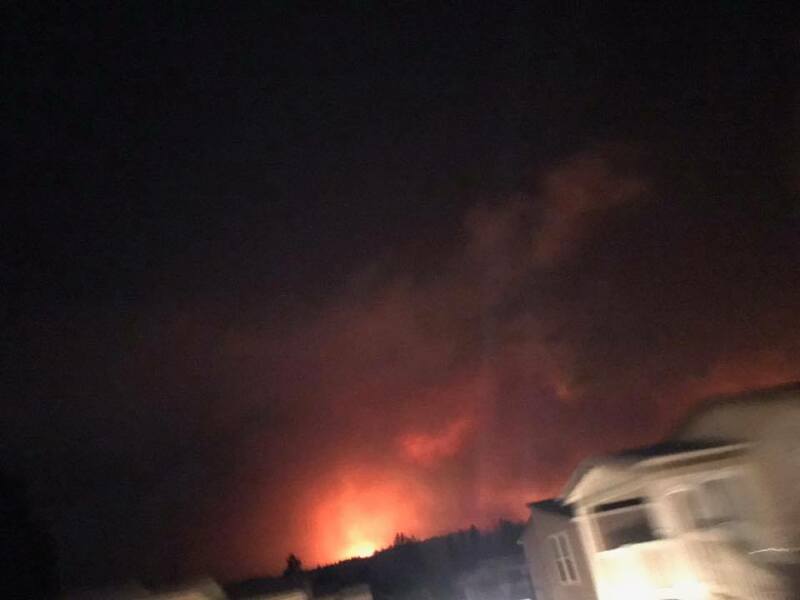 Our Associate, DES, in Santa Rosa texted us that she, her 13 year old daughter and 15 year old son went house to house last night banging on doors to get people UP and OUT of their homes as flames were as close as some peoples back yard! 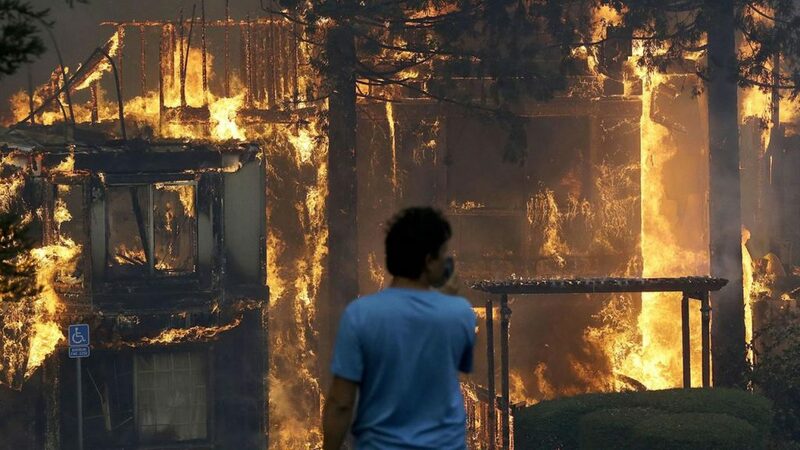 Thank You DES for your courage and stamina and will to help your neighbors survive this firestorm assault on their neighborhood! We woke those people up. They had time to secure pets grab meds and water bottles. What fruit they had and leave. 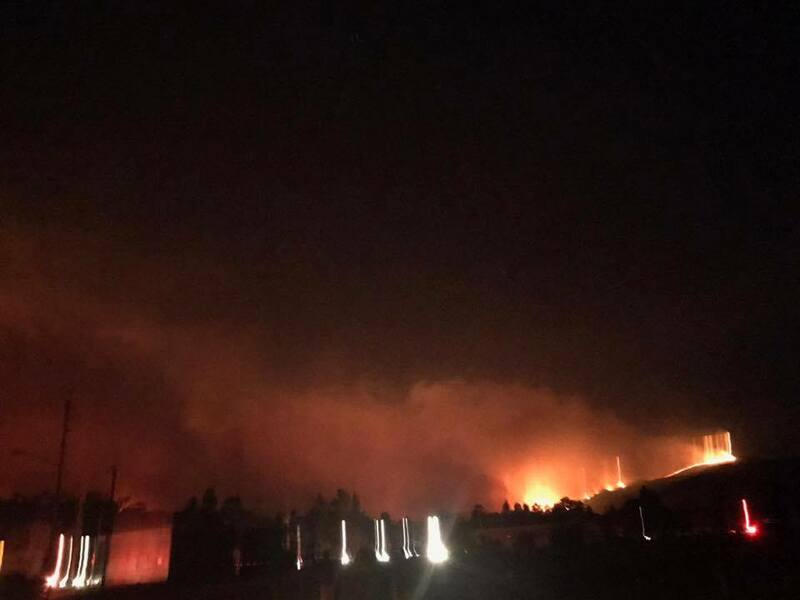 The fire had crested the hill by 1:30 am. 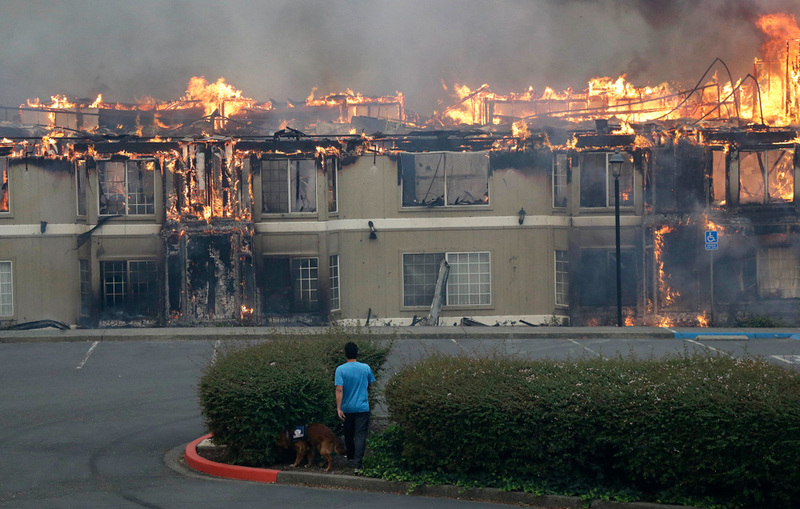 By 3 and 4 am those homes were gone. Cops were late to the party. Some elderly women refused to leave. No gas. Cars are being abandoned on side of road. Will be 3 days before fuel trucks can get in. I have 25 miles gas but we are staying despite poor air. Waiting for a pick up from a doctor friend whose hospital is evacuated. Going to help down at veterans center where they have put all the elderly including those from the hospital who are mobile. I ditched the fairgrounds with kids to hitch a ride back to our place. Fire came down snaked around and came from behind us as I predicted. Really Larry this is simply not rocket science. The wind and gullies predict the path as does the foliage. Back at our place animals are ok.
Hung wet towels over windows to keep air clean inside. Now heading down street on foot towards fire zone. Thank You DES for ALL you and your kids have done since the out break if this firestorm! 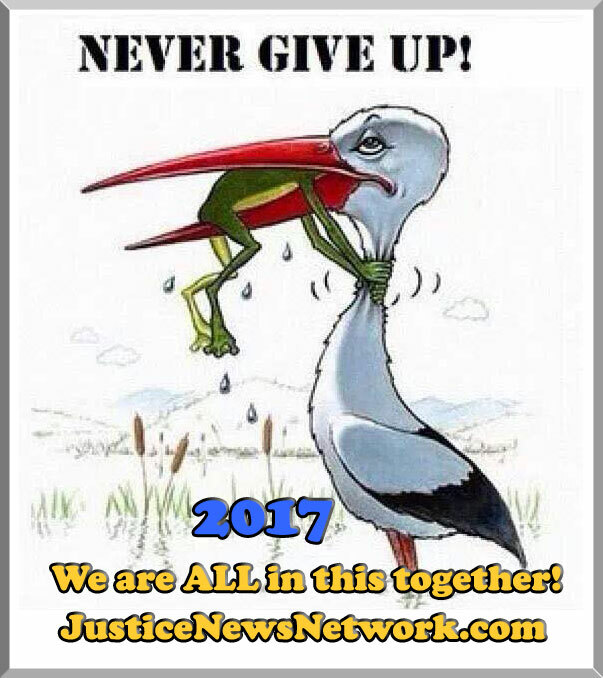 You Are ALL Heroes in our book here at Justice News Network! 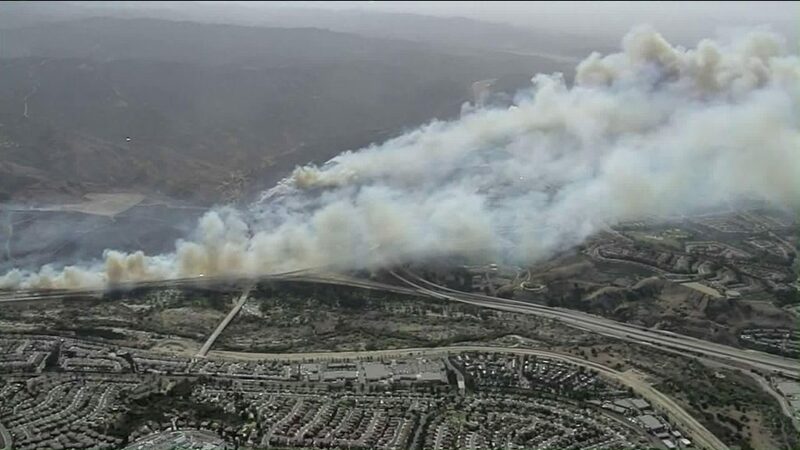 ANAHEIM (CNS) – Amid dry and windy conditions that prompted fire warnings across Southern California, a brush fire erupted Monday alongside the eastbound Riverside (91) Freeway near the 241 toll road in Anaheim Hills, forcing mandatory evacuations. 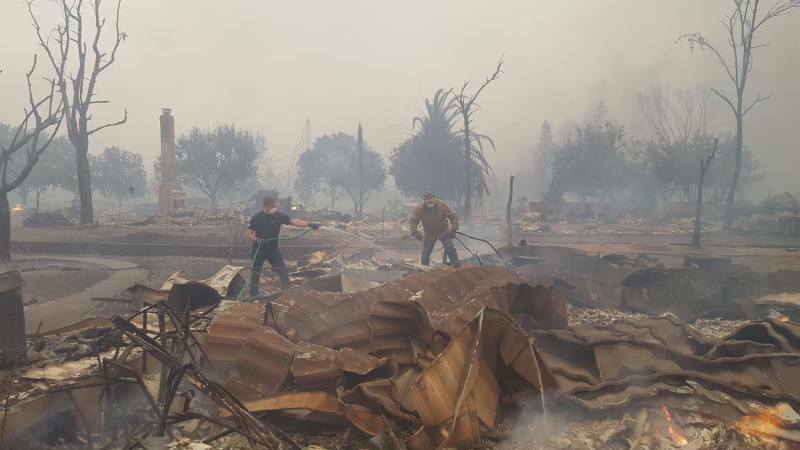 The fire, which broke out around 9:45 a.m., was burning about a mile of the area scorched by the recent Canyon Fire that blackened more than 2,600 acres and took more than a week to contain. 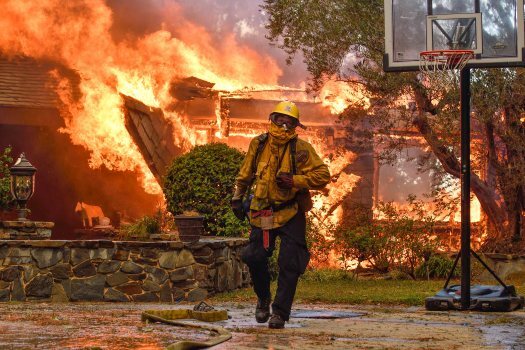 The new blaze, dubbed Canyon Fire 2, started near the 91 Freeway and Gypsum Canyon Road, according to Orange County Fire Authority Capt. 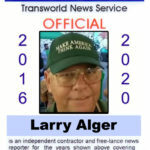 Larry Kurtz. 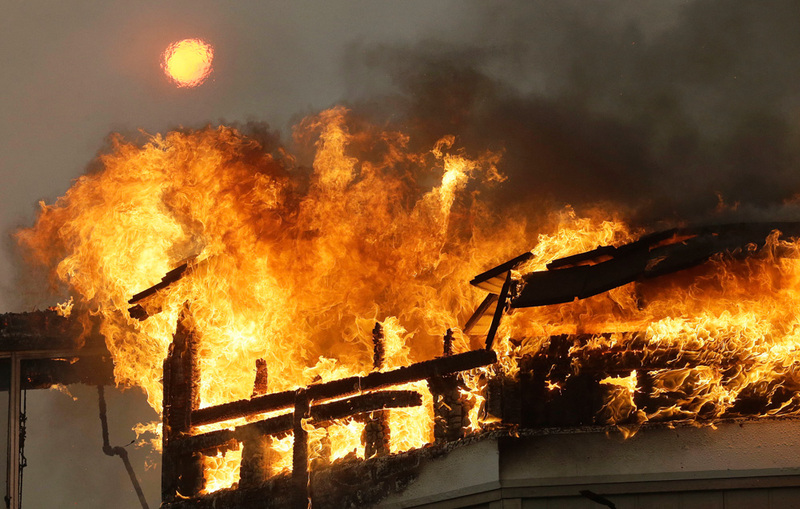 The blaze was initially reported at 25 acres, but quickly exploded in size – so quickly that fire officials could not estimate its size by midday. 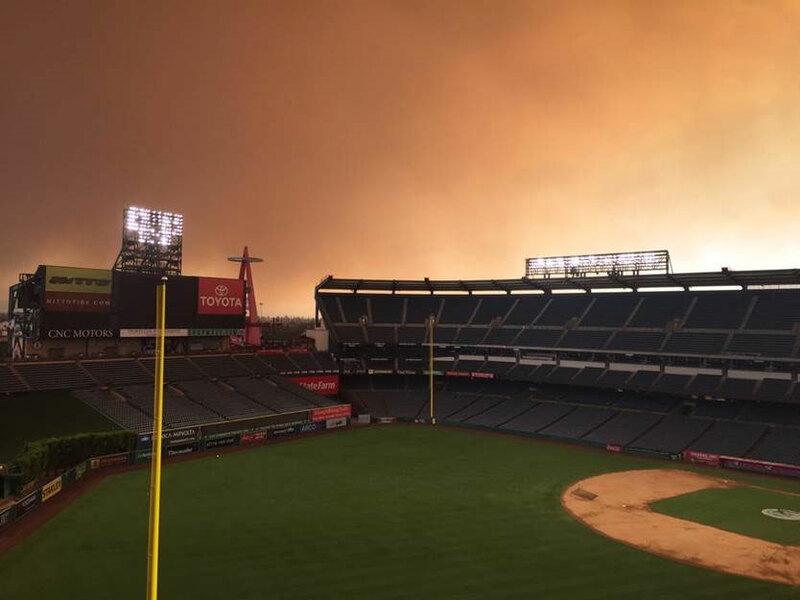 With winds whipping at about 25 mph and pushing the fire west, mandatory evacuation orders were issued for residents south of the 91 Freeway and west of the 241 toll road. The evacuation area was repeatedly expanded, reaching west toward Nohl Ranch and Canyon Rim roads. Evacuations were also ordered in the east end of Orange. Evacuated residents were directed to the Downtown Anaheim Community Center, 250 E. Center St., or the Downtown Anaheim Youth Center, 225 S. Philadelphia. 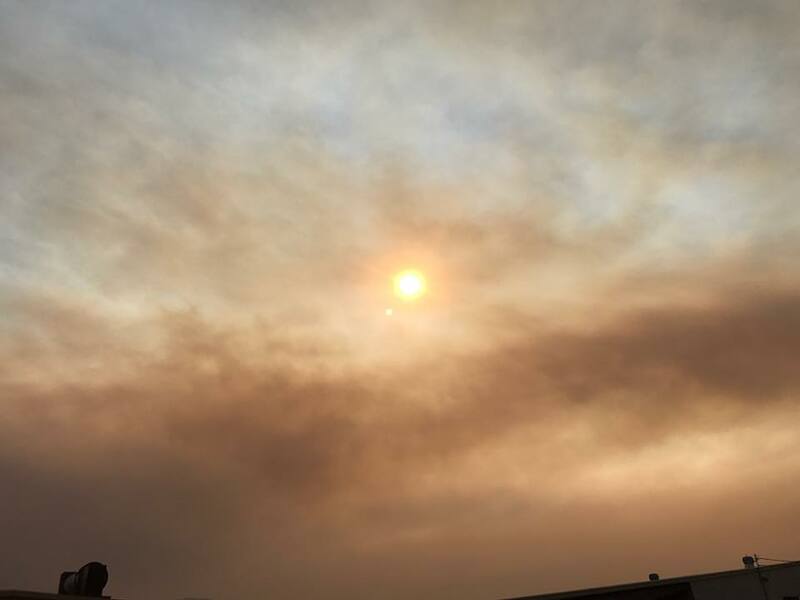 An evacuation center for horses was established on the west end of Yorba Regional Park, which was closed to the public along with Irvine and Santiago Oaks regional parks “as a precaution due to the proximity of the fire,” said Marisa O’Neil of OC Parks. All eastbound lanes of the 91 Freeway were closed in the area, along with both sides of the 241 Freeway south of the 91 Freeway. 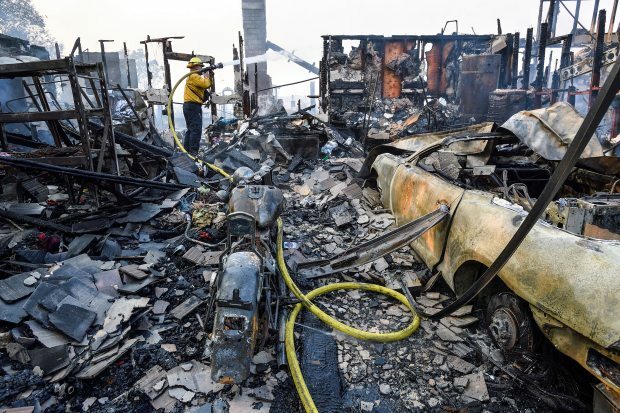 Fire fighters work to extinguish a fire on Via El Estribo during the Canyon Two Fire in Anaheim, California, on Monday, October 9, 2017. 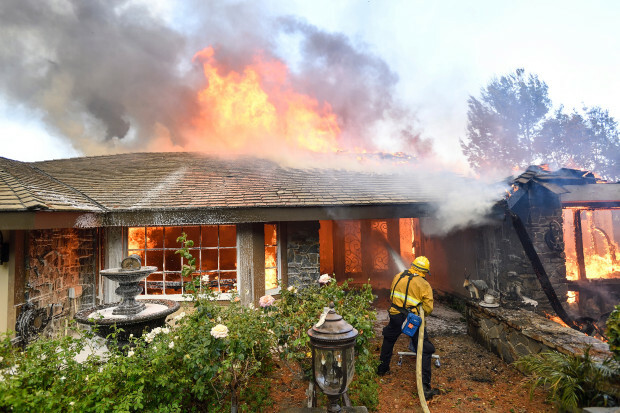 A firefighter puts out hot spots in a home that was destroyed on Via El Estribo in Anaheim Hills during the Canyon Two Fire in Anaheim, California, on Monday, October 9, 2017.